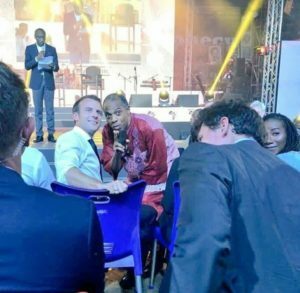 Femi Kuti, others thrill guests as French president visits Afrika Shrine – Royal Times of Nigeria. Both of them were among entertainers and industry experts gathered at the Shrine to celebrate Fela’s legacy during the visit of French President. News Agency of Nigeria (NAN) reports that Macron, who visited the shrine to inaugurate the African Cultural season to be hosted in France in 2020, is believed to be the first real President to enter the shrine. The event, hosted by Banky W and Kenturah King, was tagged ‘Celebration of African Culture’ and witnessed massive turnout of entertainers across the music industry and Nollywoood. Macron was welcomed by the Lagos State governor Akinwunmi Ambode and was given a tour of the cultural landmark, shortly before he was seen gleefully dancing as Femi Kuti performed. The New Afrika Shrine serves as the host location of the annual Felabration music festival and is currently managed by Fela’s children Femi Kuti and Yeni Anikulapo-Kuti. It is the replacement of the old Afrika Shrine created in 1970 by Fela Kuti until it was burnt down in 1977 and showcases photo galleries of Fela’s life and musical performances. Performing a medley of her hit songs, Yemi Alade stepped on stage with a crew of energetic dancers to perform live, which elicited the applause of guests, including Macron. This was followed by a short skit improvisation by Nollywood stars including Joke Silva, Dakore Akande, Rita Dominic and Ramsey Nuoah, where Macron played the role of a film director alongside Kunle Afolayan. 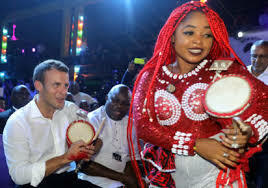 Macron earlier stated that he was not a stranger to the club, adding that he recognised the Shrine as an importance place for lovers of African culture. Davido cancels US performance due to ‘Hurricane Florence’.